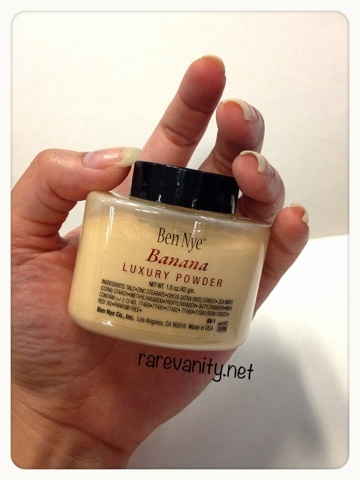 Ben Nye Banana Luxury Powder | Vanity and Everything in Between. 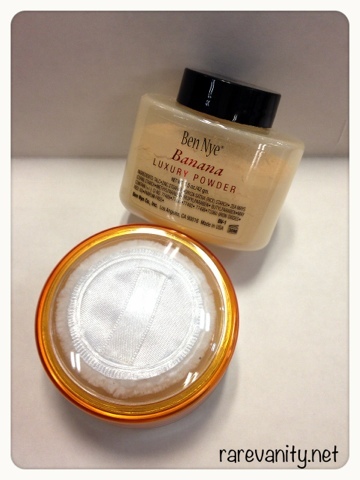 Ben Nye's Banana Luxury Powder has been making waves since last year. I've heard of this brand way back in 2008 but never paid much attention to it because it wasn't available in Manila. Well, it's still not widely available in Manila until now. But it's good to know that you can get a hold of this product at some online sellers. I've always heard good reviews about Ben Nye in general. So, when I found out that this powder was back in stock, I joined the bandwagon! The one that I have with me is the 1.5 oz. It also comes in a bigger size which is 3 oz. The photo below is a photo of how the container looks like sans the cover. 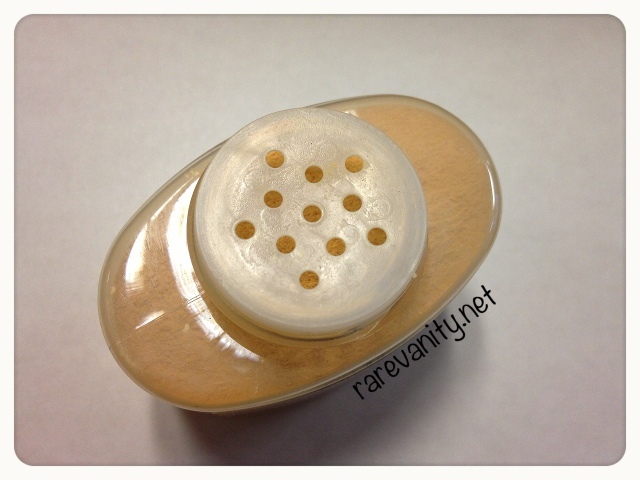 As you can see, it has big holes for a loose powder container. I think the holes of this container is even bigger than J&J baby powder. Why do you gotta be that big, Ben Nye? I transferred the Banana powder at the back of my palm. It really is a yellow powder. Some may be curious as to why you're going to use a yellow face powder? Powders that comes in different colors such as purple, green, orange, and yellow (might be missing out other colors, let mw know) actually have an effect once applied to your face. They are use to either make your face glow or even out any discoloration on your face. 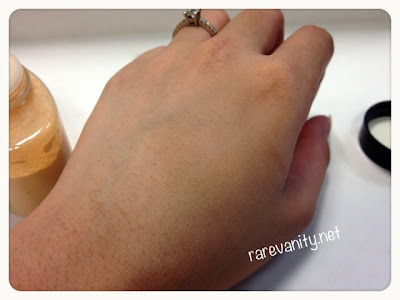 As for the Banana luxury powder, this is suitable for those with yellow skin tones. If you're using a foundation that doesn't really match your skin tone, you can try your luck by setting the foundation with this powder. The photo below is a photo of the powder blended on my skin. It is very obvious that it made my skin smoother. But the yellow shade is too apparent, IMO. This means that a little of this loose powder goes a long way. You only need a little of the powder to set your foundation. Below is a photo of me with the Ben Nye Banana Luxury powder on my face. 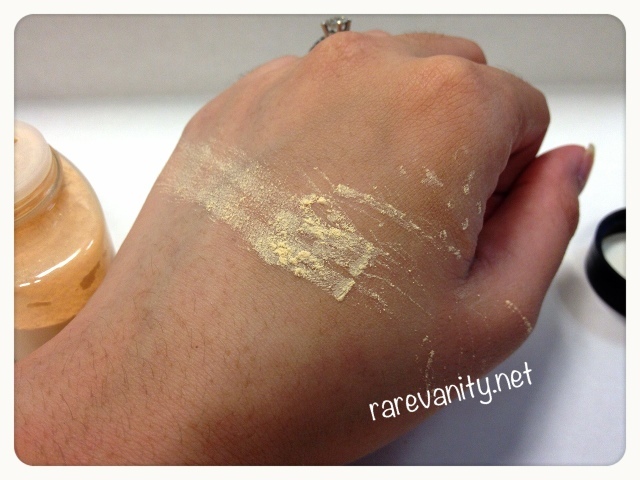 The liquid foundation that I used was Urban Decay's Naked Skin Foundation in #5. Since the container is not that travel-friendly, I bought a sifter at Landmark and transferred it there. This is also a plus since the holes of the sifter is smaller than that of Ben Nye's. Overall, this powder is okay. I actually do not see what the fuzz is all about. There are times when it doesn't match my face. Then are times when it matches my face. It probably depends on the foundation that I use. The staying power is between 4-6hours. If you are always out in the sun, then better retouch after 4 hours. But if you're just in the office, you can retouch in the afternoon. I've heard some reviews saying that they don't need to retouch the whole day. In my case though, I still need to retouch. For reference, I have combination skin (dry-oily). As for the color, never mind that it's yellow. It disappears on your face once blended. 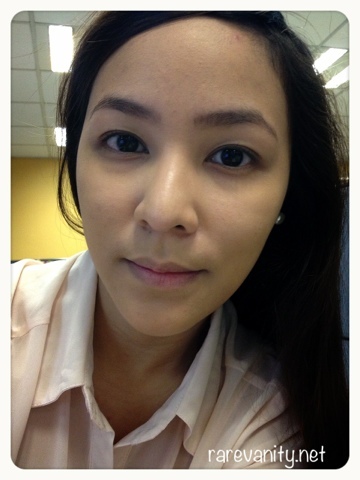 Only I feel that there are certain instances that I can see some yellow tones on my face. Ben Nye Banana Luxury Powder retails for PhP700 (1.5oz) and PhP1,050 (3oz) at Digital Traincase. I've been wanting to try this too! I have ELF's HD powder, and I'm getting tired of it. HAHA. Hopefully, I can find this around me. It's always sold out here. 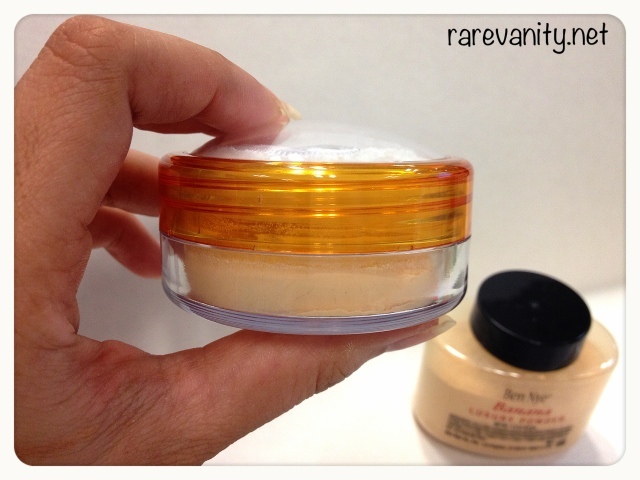 how's the ELF HD powder? Correct! Nothing extraordinary with this setting powder! this is my besties fave setting powder! she uses this to set her Dr. Jart BB cream and then top it off with Physicians formula loose powder that is her shade to balance out the yellowness and it stays all day long without caking! San po makakabili ng ben nye powder? Digital Traincase. I mentioned this above and included the link. Kindly re-read, thanks. Hi Gem! I saw this on a YouTube tutorial and I think I have to consider buying this but this is too expensive for a setting powder. :( The 1.5oz is priced at 800+ na pala. Can you please recommend me some cheaper setting powders that can be a dupe for the banana ben nye? I wanted to use this because of its color actually. Thank you so much! !